Special order of glass?! WTH does that mean? 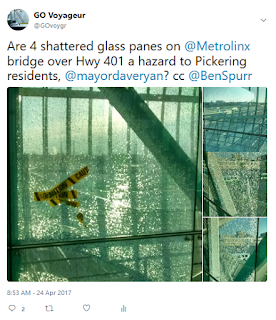 What exactly did the bridge engineers design and Mayor Dave Ryan endorse wholeheartedly? “Soon”?! Is that the same “soon” that made us wait an eternity for real-time bus info? He couldn’t speak to the fragility of the glass, but he did explain why it takes so long to replace the panes. You see, the sheets of glass originate in Europe and are shipped to Quebec where they are “heat treated” (his words). Then they are shipped to Pickering for installation. I wanted to engage him further in this discussion, but my train arrived, and I had to leave. 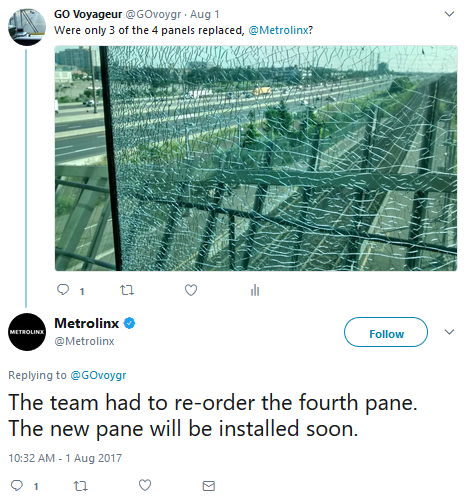 Well, that explained the “special order of glass”, and why six months after the problem was reported, it was still outstanding. But so many questions remain unanswered. Why is the original glass installed on the bridge so fragile? Is it substandard? Did the design engineers miscalculate something? Is vandalism the cause for all this shattered glass? Why do replacement panes need to be sourced from Europe? Are there not more economical sources of glass in North America? What is the total cost of ownership (TCO) of this structure? 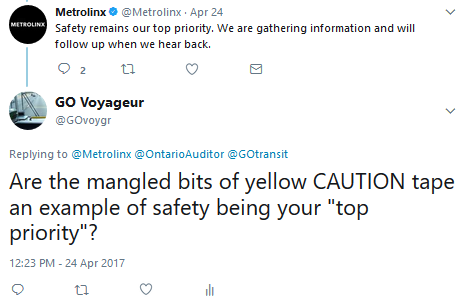 Is it time Ontario’s Auditor General, Bonnie Lysyk, met with Metrolinx’s new President and CEO, Phil Verster, to get acquainted and review some numbers? 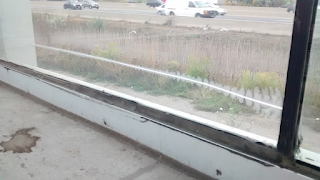 I live in Pickering and take the train from the Pickering station daily. I can attest to the fact that since the bridge was built, at least one pane of glass is broken on any given week. 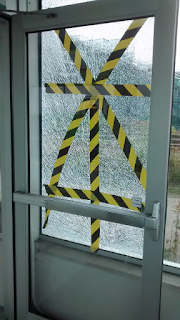 For these panes to shatter as often as they do is not good. We live in Canada with harsh winter weather and we expect that exterior windows of a publically accessed building will withstand our winters. 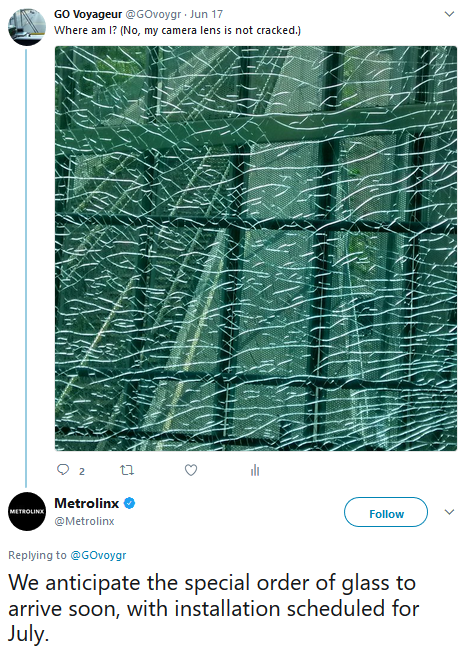 But hell, what more can you expect from Metrolinx but to continue to engage in contracts that bring inferior products to our stations. Metrolinx is about the most untransparent, incompetent government agency out there...and that's saying a lot given Government agencies in general act in about the same manner. Like you, I wounder was there really no local supplier that could provide the glass at a decent price? Toledo Ohio used to be "The Glass Capital Of The World". Whatever happened to that position? 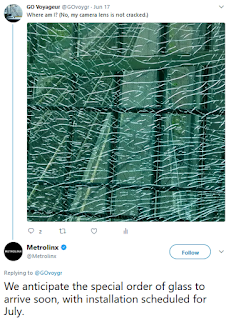 Why not try that city for obtaining glass from a North American source? Bridge was built by the lowest bidder. No requirement for bidder to show their ability to do the work.